I don't sleep well, I toss and turn all night. The small curtains in the window by my knees in the trailer bunk flap all night. I look out the window above my head and see swift moving clouds that obscure the full waning moon. Second Wind and AJ wake and we all start to get packed up in the darkness. I use the flashlight on my phone to illuminate a water bottle that casts light in the small space like a lamp. One by one we collect by the gate in the swirling wind and dust. Our headlamps shine into the darkness. Off towards the east city lights illuminate the sky and clouds. We set off into the wind and towards the trail. Each of us falls in line. Slowly, the light grows on the horizon. I move quickly and leave behind everyone else as I walk along the eerie rushing water on the open part of the aqueduct, so weird as it's right in the middle of this dry desolate landscape. Whose toilet will it end up in? Shower, sink, car, bottle? I wonder. I see kangaroo rats bouncing around in the growing light and I find a pair mating in the tall grass, unashamedly. My mood is dark and it swirls around me, like the wind. I pause at a bridge, waiting for my friends to catch up. We turn out into where the aqueduct turns into a pipe, that seems to stretch on and on and into forever. Bananas takes the lead and he hikes on fast. The bolts in the pipe hurt my feet, even with new insoles in them. A small pain begins to radiate from the top part of my ankle, right where my foot connects with my leg. I block it out and hike on and on. It's the feral dogs I've heard about before. Two of them stand before Bananas and I up on a hill, bristling at us. We stop and arm ourselves with our trekking poles. "Dogs! Dogs! Dogs!" The others yell down to each other in echo. The dogs lift their tails high and trot off sassily into the sagebrush towards a house. We all collect and wait and eat snacks together. "I think they're gone," I say as I heave my pack back on. "They can come for me if they want." I walk off back along the aquaduct. Soon, it flattens into a cement road. I eat a few candy snacks and walk and walk. I find a small bit of shade after hiking 10 miles and I take a break. The others collect around me. Bananas plays music. Baloo tosses her trekking pole in the air. I roll a cigarette the stress and sadness of breakup still clings to me and I hate it. I eat some tuna and cheese crackers with my titanium spoon I attach to the outside of my pack. I lay down my small sit pad I collected from a hiker box and try to take a small nap in the dirt. Red ants bite me awake and my dreams collide with the conversation that swirls around me. I pack all my things up and slowly stand, gingerly, hobbling a little. Standing is always so hard after sitting for a while. The sun climbs up high in the sky and I walk and walk. My ear buds pour in the sound of Tame Impala, their Currents album which is all too fitting for my breakup feelings. I find Second Wind under the shade of a Joshua tree. I stretch out my aching foot as we chat. All around us are giant wind turbines going WOOSH WOOSH WOOSH. Cutting the wind and turning their great blades. They seem almost like living creatures, waving their white arms for miles and miles, making swirls and stars out of my pupils. Behind me I can see Little Engine Bananas and Baloo approaching for another break. I decide to push on to the next water source. I walk along the dry hot dusty road. The wind pushes all around me, cooling me when it's too hot. Small spurs jut off the main dirt road where ATVs or dirt bikes have cut across the land. The wind turbines spill out across the horizon. It's dizzying and somewhat sooothing watching them turn, turn, turn. I find the small side trail down to a tank with a faucet attached to it. Three girls stand around together talking excitedly. It takes them a minute to notice me, as I fill my bag up with water. I can't wth them, and find out that they're three sisters, doing a section hike. Their packs are enviously small. Sarg, Corperate and Giggles are their names. 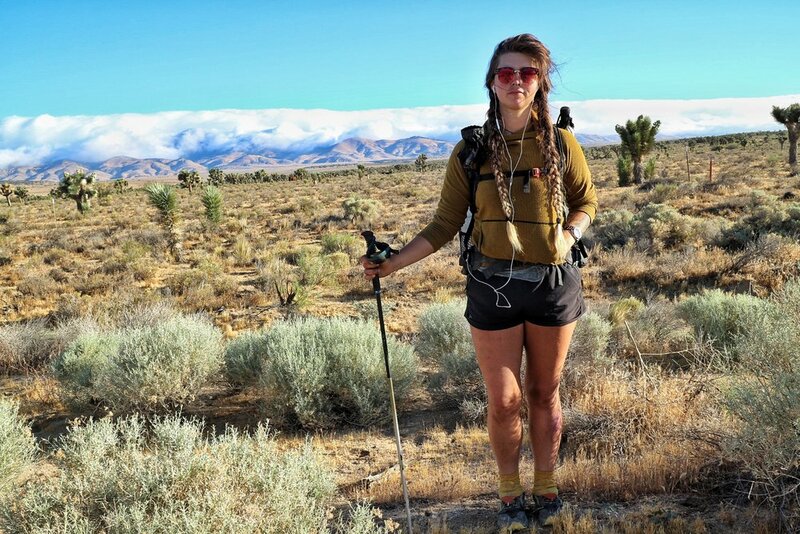 Corperate and I kvetch over breakup blues, her boyfriend broke up with her just as she began her hike. Another hiker shows up, named Snake. We talk of relationships until I decide to take shelter under a tin sheet of a roof up on a hill, with bullet holes all through it. It was built by some wonderful person to sheild hikers from the persistent winds. I spread my things out and cook a little lunch, alone. Blissfully alone. I can see hikers collecting at the water faucet off in the distance. Caveman and Hotlips, two older hikers show up and sit with me. Twisted, a German hiker I met a while back at Hiker Town shows up too and we all sit together while the wind batters the small shelter. Hotlips gives me relationship advice, after I light another stress cigarette. Twisted sits close next to me. His dirty blond hair falls into his face like the forelock of a pony and he speaks in his thick German accent. We all talk quietly and intermitently. I gather my things to press on towards my camp site for the night. Twisted heads out in front of me from a ways away. The turbines twist and rush. As I walk by one itgoes BEEEP BEEEP BEEEP, the noise startles my sensitive hiker ears. I climb up and down, up and down in the golden evening light. Eventually, I drop down into a camp with a small creek. Annie is there, with Twisted and the three sisters. I gather some water from up the creek. We find toilet paper and pee marks just less than 20 feet from the creek. Idiot hikers! Contaminating our water source. I lay out my pad and my trail family and I pile up together. Eating dinner and sharing food with each other. I burrow into my sleeping bag as night falls. Frogs croak. My emotions run thick. I roll over to face a sagebush, it's strange acrid scent reminding me of my ex and I hate it. I look up into the sky and release a deep breath. Soon this feeling will be over. Soon, it will be gone.